You are here: Home / Column / What are the core requirements of wide area CBRNe training? 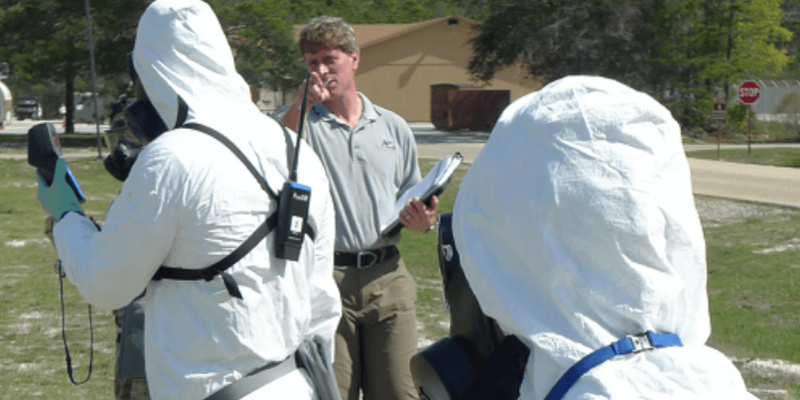 What are the core requirements of wide area CBRNe training? When you are required to conduct wide area emergency preparedness training – be it in the setting of a chemical, biological, radiological, nuclear, and explosive (CBRNe) school, a dedicated military center or an industrial facility – the ongoing challenge for any CBRNe instructor is to be able to create a scenario that is realistic, safe, reliable and cost effective. Trainees need to be equipped with the practical knowledge and skills to respond with confidence to an enormous variety of potential live incidents. And each threat brings with it a unique set of practical, physical and psychological tasks that need to be ‘experienced’ in order to be understood. So what is the recommended approach to help instructors implement a realistic but safe CBRNe training environment? While the spreading of chemical simulants can still occasionally be an option, strict environmental regulations generally make it unfeasible – and the use of any form of radiological source is almost always going to be unrealistic for all but the most high specialized of training facilities. Simulant training also brings with it the problem of being very location-dependent, which restricts the ability to create scenarios in public settings or confined spaces. And there is the added difficulty of it not being able to be readily integrate simulant training with other conventional live training methods. When the highest degree of realism is required, a powerful modular exercise control system such as PlumeSIM enable instructors to take their CBRNe training exercises to an entirely new level. And it especially comes into its own in the context of counter terrorism scenarios, nuclear training drills and HazMat emergency exercises. So what benefits does the PlumeSIM training system offer? Portability – Plume-SIM is highly portable making it quick to set up and to use in any environment. The inclusion of a planning mode also means that instructors can easily prepare exercises on a laptop or PC without the need for any form of system hardware. Realism – Students are equipped with simulators and GPS enabled players, to enable them to take part in large area exercises that can include sequential multi-threat releases or that integrate with third-party live training systems. Instructor control – The instructor retains complete control of the exercise including the ability to decide the type, quantity, location and nature of the source. Environment – Specific environmental conditions can also be easily defined by the user, including temperature and changes in wind direction. Repeatability – The Plume-SIM’s exercise parameters can be saved so the identical scenario can be repeated as many times as required. Real-time action -The trainees’ movements, progress and instrument usage can be monitored in real time from a central control station. After action review – The recording of student activity in real-time provides useful after action review (AAR). This can be used to encourage discussions about the effectiveness of an exercise and to facilitate further improvements. Data capture – All recorded exercise data can also be exported and emailed to external personnel for future analysis. Pre-exercise capability – The table-top planning mode uses standard gamepad controllers which enables trainees to undertake pre-exercise practice to take place within the classroom environment. The exercise can also be recorded and analysed prior to heading for the live field training area. Versatility – If environmental conditions preclude the ability to obtain or maintain continuous long-range radio communication then the scenario can be pre-loaded on the player unit for timed activation. Compatibility – The Plume-SIM system is compatible with a wide variety of simulator equipment including the M4 JCAD-SIM, CAMSIM, AP2C-SIM, AP4C-SIM, RDS200-SIM, EPD-Mk2-SIM, AN/PDR-77-/VDR-2 and RDS100-SIM. Room to grow – The modular system gives instructors the flexibility to expand their range of training equipment as and when their budgets allow. Achieving the highest level of realism in CBRNe training is paramount – and assuring personnel safety will always be key. A flexible, modular simulator-based training solution such as the PlumeSIM system can provide trainees with the opportunity to practice and perfect their response to a wide variety of highly-realistic simulated threats in a completely safe environment. http://hazmatmag.com/wp-content/uploads/2019/03/hazmat-training.png 403 806 hazzmatt1 http://hazmatmag.com/wp-content/uploads/2017/01/hazmat-logo.jpg hazzmatt12019-03-22 18:19:282019-03-22 18:19:31What are the core requirements of wide area CBRNe training?